What is galena? What is it used for? Also known as litharge or lead oxide, galena is a type of ore. Galena has several industrial uses, including the creation of storage batteries, crystal radio sets and some types of glass, as well as a pigment. In addition to its industrial qualities, galena is sometimes used as a medicinal. Typically, it is mined, washed thoroughly, then crushed into a powder before use. According to the principles of traditional Chinese medicine, litharge has salty, spicy, and slightly toxic properties, and is affiliated with the Spleen and Liver meridians. It helps to eliminate toxins and kill intestinal parasites. Conditions that can be treated with galena include ringworm, skin rashes, rosacea, eczema, sores, ulcers, and other skin disorders. There is also evidence that galena can kill some types of fungus. It is usually combined with other herbs to achieve maximum effectiveness. How much galena should I take? 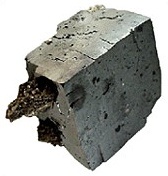 Galena is almost always used topically, with the amount of galena depending on the area being treated. If being taken orally, the maximum recommended dosage of galena is 1 gram pre day, decocted in water. What forms of galena are available? Powdered galena can be found at some specialty stores and Asian markets. It is usually combined with other herbs and mixed with water to form a type of paste or poultice. What can happen if I take too much galena? Are there any interactions I should be aware of? What precautions should I take? Because of galena's high lead content, it is considered toxic. Long-term use, or short-term use of high doses of galena, is strongly discouraged. As always, make sure to consult with a licensed health care provider before taking galena or any other herbal remedy or dietary supplement. Al-Awamy BH. Evaluation of commonly used tribal and traditional remedies in Saudi Arabia. Saudi Med J December 2001;22(12):1065-8. Bogdarian IuA, Bundin DV. Basis for the use of a new galena-based substance from plants for prevention and treatment of cholelithic disease. Eksp Klin Gastroenterol 2003;(3):47-9, 117. Chen JK, Chen TT. Chinese Medical Herbology and Pharmacology. City of Industry, CA: Art of Medicine Press, 2004, pp. 1044-1045. Hardy AD, Vaishnav R, Al-Kharusi SS, et al. Composition of eye cosmetics (kohls) used in Oman. J Ethnopharmacol April 1998;60(3):223-34. Tsoucaris G, Martinetto P, Walter P, et al. Chemistry of cosmetics in antiquity. Ann Pharm Fr November 2001;59(6):415-22.